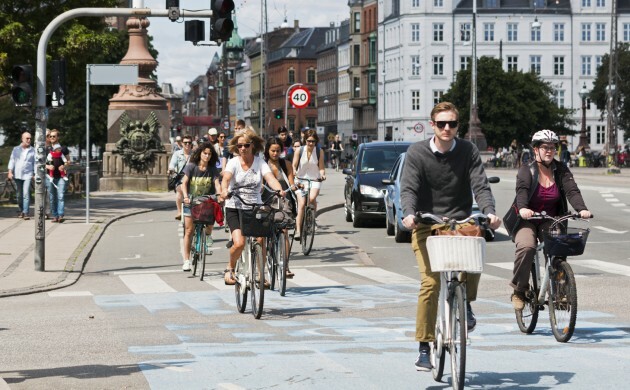 From September 1, cyclists in Denmark will be allowed to take right turns at red lights at selected intersections around the country, reports the Danish cyclists’ federation that has been campaigning for the possibility for years. “It will create flow during daily cycling trips, which is the most important thing for everyday cyclists,” Klaus Bondam, the head of the federation, told DR.
A successful two-year trial period at 33 crossroads showed that right turns at red lights for bicycles did not jeopardise traffic safety. However, traffic researcher Harry Lahrmann from Aalborg University is sceptical about the proposal and calls for a detailed research before the right is granted. Meanwhile, a new study by the Technical University of Denmark (DTU) has revealed that cycling in Denmark is more dangerous than driving a car. Based on figures from 2007 to 2010, cyclists are 3-4 times more likely to get seriously injured in traffic accidents than motorists. According to the road directorate Vejdirektoratet, some 26 cyclists were killed and 392 were seriously injured in traffic accidents in 2010, and the trend was similar in 2015, when 26 cyclists lost life and 512 got seriously injured. Thanks to targeted campaigns, however, the number of right turn accidents has significantly decreased over the past 10 years. While in 2005, some 11 cyclists were killed and 27 were injured in right turn accidents, only 1 person lost life and 5 got injured last year. The road directorate is also becoming more concerned about the safety of electric bike riders. In 2014, three electric bike riders lost their lives in traffic accidents, but the number grew to 8 last year. Moreover, some 20 el-cyclists got seriously injured in both 2014 and 2015. Electric bicycles accelerate faster than regular bikes and can reach the speed of up to 25 km/h, explains the road directorate. About 10 percent of all new bicycles in Denmark are electric and they are popular especially among the elderly and women.